Jyoti Gupta, 30, is a homemaker. She used to work as a real estate agent until slowdown hit the industry. While she was struggling to make ends meet, Bitcoins caught her fancy. Given the digital currency's speculative nature, she earned good returns in a short period. "I have made good money over the past one year. I will continue to invest in Bitcoin," she says. Many people in India have started buying and selling crypto currencies, a digital currency where encryption techniques are used to regulate the generation of units and verify transfer of funds. These operate independently of a central bank. India has over one million Bitcoin users; the country accounts for almost 10 per cent trading in volume terms. According to a recent report by PHDCCI, combined trading volumes in India could be in the range of Rs 200-250 crore per month. Trading in crypto, or virtual, currencies has surged due to extraordinary returns. For example, Bitcoin, the oldest and the most popular virtual currency, has given 30 times returns over the past four years. The value of the currency surged from $100 in June 2013 to $3,025 in June 2017. Similarly, Ripple, a crypto currency based on inter-bank settlements, has given 200 per cent returns over the past three months ended July 31. The other reason for such an increase in volumes is the low returns given by other asset classes such as real estate, fixed deposits and gold. While awareness about Bitcoin and altcoins (virtual currencies other than Bitcoin) has been rising, for investors, there are several concerns that they should be aware about. 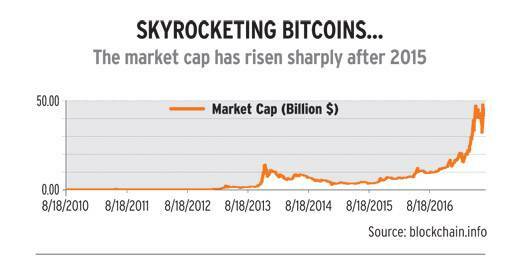 For example, Bitcoins are not backed by any tangible asset but sheer demand. Unlike other investments, there is no underlying asset; its value is measured by just demand and supply. Moreover, there is a lot of opacity behind their operations. For instance, no one knows who is behind the creation of Bitcoin. Most important, the crypto currency market is not regulated in India. If you lose money in a bank, you can complain to the Reserve Bank of India (RBI). But for Bitcoin, there is no regulator you can turn to. Given these concerns, the government formed a committee this April to give recommendations for regulating the crypto currency market. The committee members, however, have not reached any agreement yet. The report is still awaited. Several issues, ranging from who could be its regulator to how secure are these transactions, are being deliberated at the government level. In 2008, after the subprime mortgage crisis, governments of a number of developed countries had to print billions of dollars to bail out banks and insurance companies. The surplus money weakened and debased several top-notch currencies. It was during this time that Satoshi Nakamoto (a name used by an unknown person) launched Bitcoin, through which one can pay each other without an intermediary. The idea was to have a currency with limited supply that was impossible to devalue. Unlike central banks, which can print money on the basis of the needs of the economy, Bitcoin is mined by bots. When the algorithm was created, it was decided that 21 million Bitcoins will ever exist. At present, over 17 million are in circulation; it is expected to be fully mined by 2140. After Bitcoin, hundreds of altcoins have been launched. 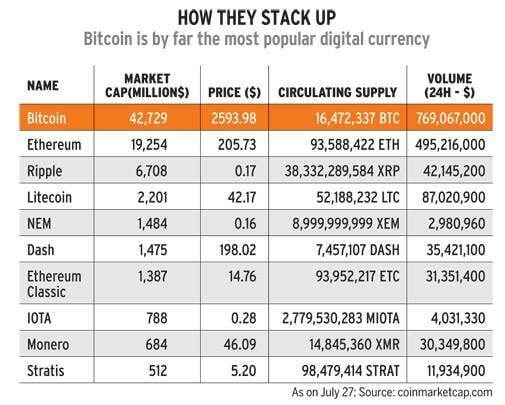 But Bitcoins have 40-50 per cent market share in value terms. The underlying technology of digital currencies, including Bitcoin, is Blockchain. "It is a distributed database that maintains a list of transactions called blocks. It is secure by design and inherently resistant to modification of data," says Prateek Ranjan Sengupta, CTO, Liberin Technologies, which is into cloud and web services. Archit Tyagi, CFO, Bitxoxo, a Bitcoin exchange, says, "Unlike fiat currency, which is governed by law, Bitcoin is governed by the simple rule of demand and supply. It is similar to gold in terms of valuation and is governed more by demand and supply than external factors." Though there are hundreds of virtual currencies, most of the trading happens in just 10. According to the Coinmarketcap website, there are more than 1,000 crypto currencies in the world having a total market cap of around $90 billion. Ethereum is the second-most popular with a market cap of $18 billion; it is trading around $202.93. While Bitcoin is only a currency, Ethereum functions as a token and can run any application in a decentralised ledger. "It is a decentralised platform that runs smart contracts: applications that run exactly as programmed without any possibility of downtime, censorship, fraud or third-party interference," says the Ethereum website. Ripple is third-largest with a market cap of $6 billion; it is trading at $0.17. Unlike Bitcoin and Ethereum, no mining is involved in Ripple. It is a pre-mined currency used for settlements. Banks around the world are partnering with Ripple to improve their cross-border payment offerings. The website says Ripple solutions lower the cost of settlement by enabling banks to transact directly, instantly and with certainty of settlement. However, the problem with many virtual currencies is that the credentials of people behind it are not known. As a result, many fake currencies are also in circulation. We discuss these and some other pitfalls of buying and selling digital currency. The RBI said on February 1, 2017, that it has not given any licence or authorisation to any entity or company to operate virtual currency schemes or deal with Bitcoin or any other virtual currency. "Any user, holder, investor or trader dealing with virtual currencies is doing it at his own risk," said the RBI release. "In India, we don't recognise them. The government has not issued any notification in the regard," says Amit Jaju, Partner, Fraud Investigation & Dispute Services, Ernst and Young India. The committee appointed to give recommendations for regulating the crypto currency market was supposed to file a report in three months. But given the complexity of the subject, it has not arrived at any agreement yet. Dinesh Sharma, Special Secretary in the Economic Affairs Department and Chairman of the nine-member inter-disciplinary committee, says, "We are discussing the status of the crypto currency market and will soon come out with a report." There are several points of contention. For example, there is a debate on whether to treat it as a currency or as a commodity. Similarly, if regulated, should it fall under The Reserve Bank of India Act, 1934, The Securities Contracts (Regulation) Act, 1956, the Consumer Protection Act or the Information Technology Act? "We have suggested the setting up of a team to observe the work being done by exchanges. We have asked that the burden of consumer protection should be on the task force till they feel comfortable about the technology behind the crypto currency market," says Saurabh Agrawal, Co-founder and CEO, Zebpay. 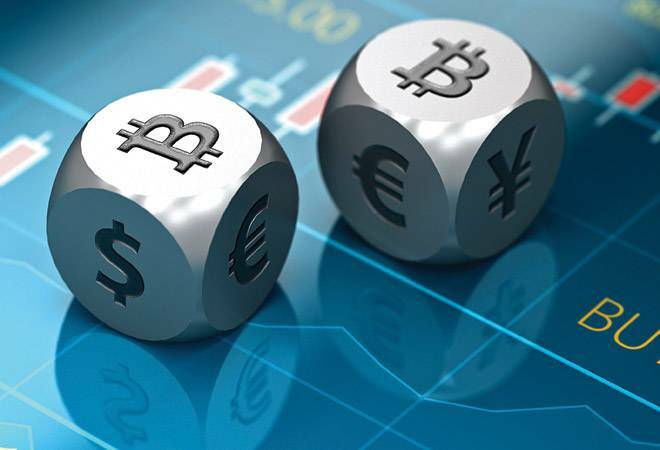 Recently, several countries such as Japan, Singapore and the US declared Bitcoin a commodity. Australia also treats Bitcoin as a commodity. On the other hand, China and Russia are still working on the legalities. Sathvik Vishwanath, CEO & Co-Founder at Unocoin, says, "India is a few years behind the major Bitcoin markets like China and USA. Nonetheless, it is beginning to wake up to Bitcoin in full force. Governments, banks and start-ups are lining up to explore both Bitcoin and blockchain." Having said that, mining, buying and selling virtual currencies is not illegal in India, but it is also not recognised by law either; there is a question mark on the taxability aspect too. You should stay away from these currencies if you don't understand the risks involved. In an incident, an anchor on Bloomberg TV flashed his Bitcoin gift certificate on the screen, giving a hacker the opportunity to scan the digital QR code with his phone and take the money himself. Experts say the anonymity and the fact that there isn't any central authority managing the transactions make it a treacherous financial instrument and highly vulnerable to cyber attacks. In case of any fraud, there's no one to be contacted for help, and there is a high chance of the culprit getting away. "Absence of information about counterparties in the transaction is a major drawback and may lead to unintentional transactions such as money laundering," warns Gopal Jiwarajka, President, PHDCCI. Second, to keep Bitcoins safe, you have to keep your username and password confidential. Bitcoins are held in digital wallets with one public and one private key. The public key is equivalent to your mobile number when you transfer money through the wallet. The private key is like your username and password which you have to keep confidential. Amit Mittal, Founder and Chief Consultant Officer of eSilverbucks Consultants, says, "The password of your Bitcoin wallet is irrecoverable. If you are unable to access the password of your wallet, your entire wallet balance will be worthless. Hence, it's really important for you to maintain your account's privacy." Similarly, balance transfers of Bitcoins are irreversible. "Bitcoins once stolen by unethical hackers are irrecoverable. Hence, it's better to keep your spending and saving wallets separate," says Amit Mittal. Besides, there isn't any restriction on the number of wallets you can have. So, you can reduce risk by increasing the number of wallets. But make sure you can manage these accounts without compromising on privacy. Third, there are a lot of fake currencies. Before trading in any crypto currency, you should look into the underlying project, market cap and past performance. It is important considering that each currency has different projects. If you plan to invest in any of them, you can learn more about their projects through their websites. Tyagi of Bitxoxo says, "Initial Coin Offerings, also known as ICOs, is the crypto currency version of crowd-funding. It is advisable to analyse ICOs before investing in new currencies." In an ICO, there are specific projects with pre-designated prices which don't change during the offering period. The Ethereum ICO was open for 42 days in 2014 and collected 31.5k BTC ($18.4 million at the time) during the period. Fourth, you should be careful of agents selling you crypto currencies on the promise of delivering high returns. Considering that there are so many exchanges, experts say one must deal only with those that have been registered on the bitcoin.org website. Sahil Baghla, Chief Executive Officer, EH1 Infotech, and an ethical hacker, says, "Many new exchanges have been opened. But to keep your money safe it is better to deal with exchanges that have been registered on bitcoin.org." Finally, start with a very small amount. Don't put all your eggs in one basket. Always diversify your portfolio by investing in other asset classes as well. The government is yet to give its verdict on virtual currencies, but till then people like Jyoti should understand its speculative nature before investing and trade at their own risk.